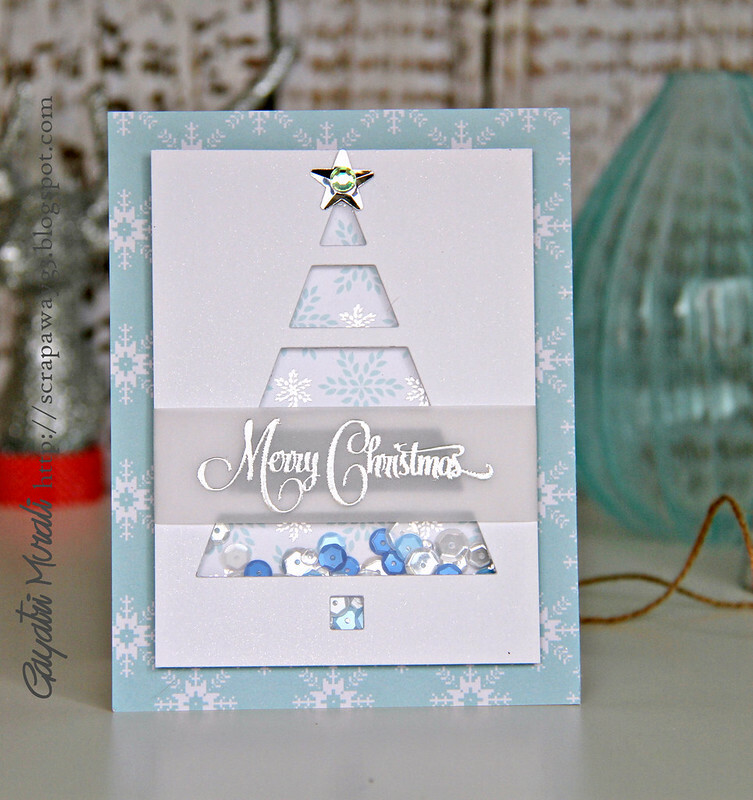 I have a shaker Christmas card set to share today. This is my 8th set in my Christmas card series this year. 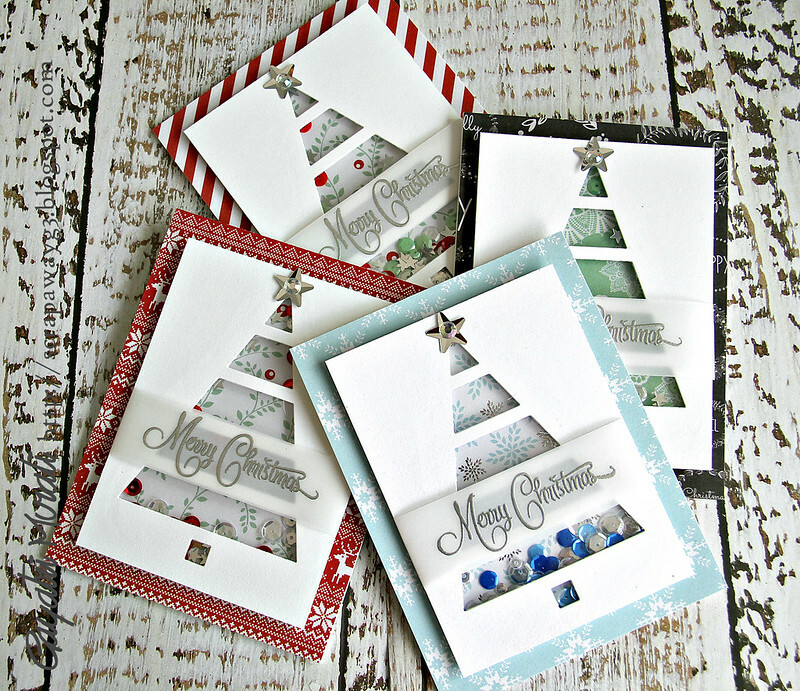 I am so thrilled sharing my card sets this year. Hoping next year I will be more organised and have some graphics and a format. Today’s set does not have tutorial as I got carried away and made all my cards watching television. Then realised that I had not taken photos while making them. So very sorry. But this shaker card is easy that I will write down the instructions for you. Here are all the four cards together. 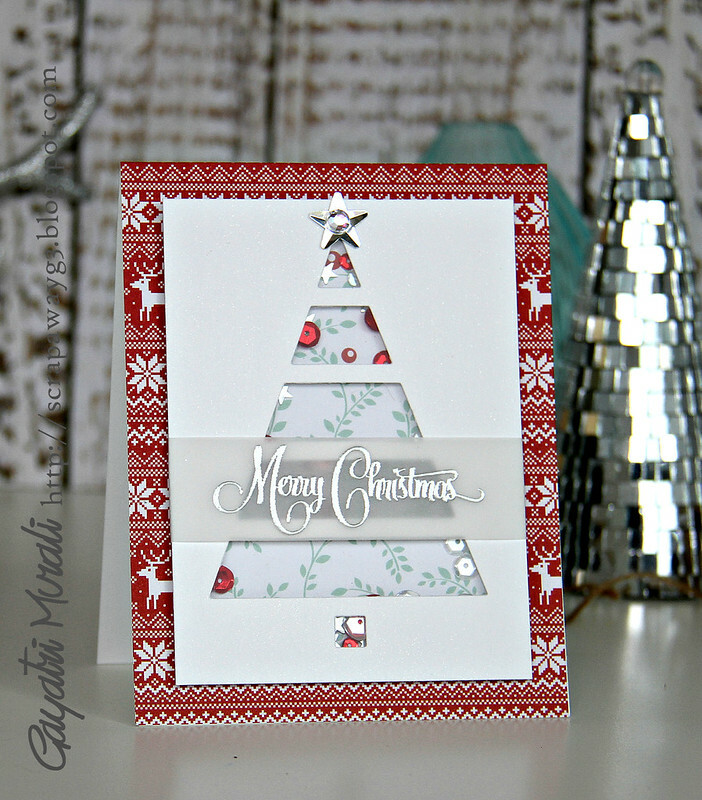 I have used the Christmas Tree Cutout die namics from My Favorite Things to die cut my white card panels to make the shaker panel. Here is the first card in the set. 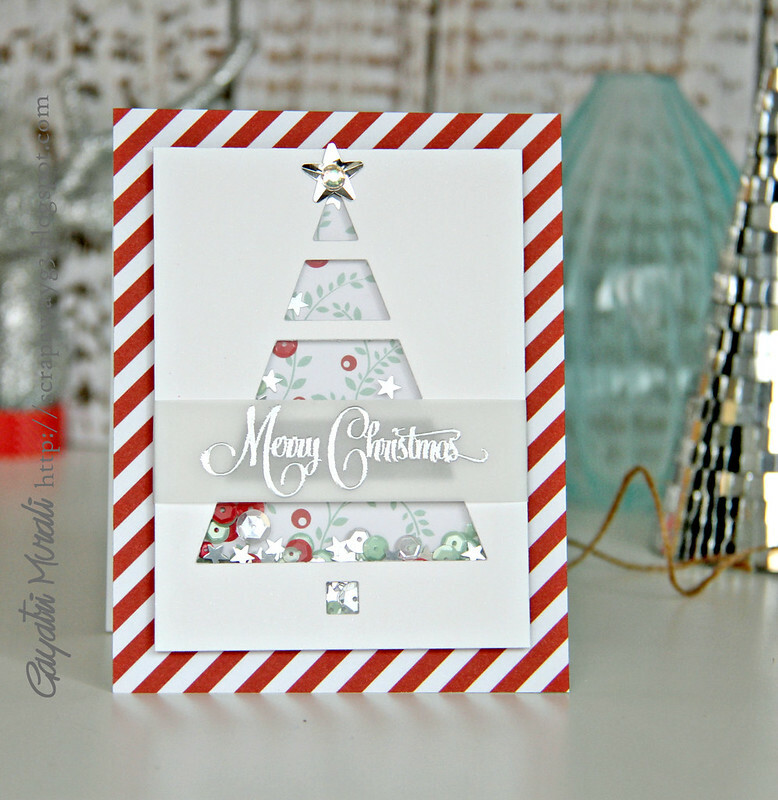 Pattern papers: North Pole 6 x 6 paper pad from Kaisercraft. Specialty paper: Vellum and acetate cardstock. Accessories: Sequins and Silver star from Pretty Pink Posh, Rhinestones from Simon Says Stamp, foam adhesives, tape adhesives, cuttlebug, silver embossing powder, heat gun, powder tool, tiny star confetti from stash and Shimmer clear sparkle Spritz from Imagine Crafts. 2. 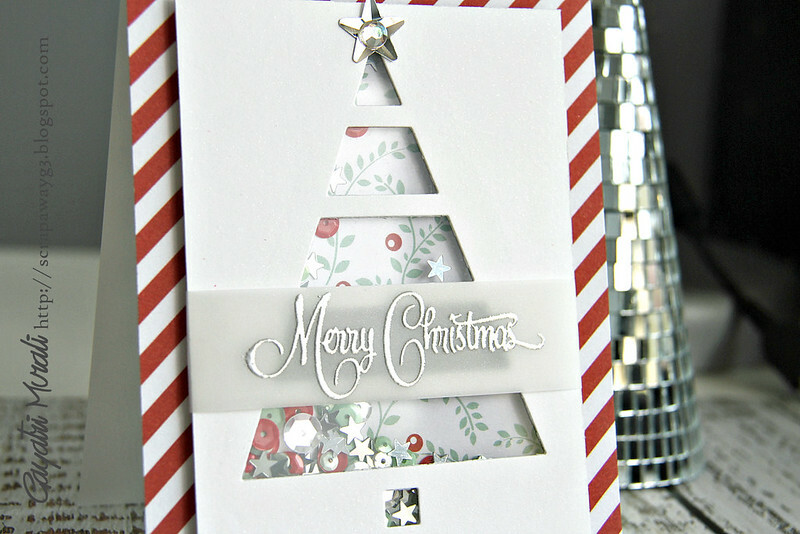 Trim the red diagonal striped pattern paper from North Pole paper pad to the card front size and adhere to the card front. 3. Trim white cardstock to 3 1/2″ x 4 3/4″. Spritz the clear sparkle on the panel and let it dry. LOVE the shimmer this gives to the white panel. 4. Diecut the Christmas tree using the die. 5. Trim the acetate to the panel size and adhere on the inside of the panel. 6. Add foam tape around the tree. Add the sequins from Pretty Pink Posh coordinating to the pattern paper. 7. Cover with pattern paper trimmed to the size of panel. Shaker box is ready. 8. Stamp and silver heat emboss the sentiment on vellum and trim to size. 10. Adhere this shaker box to the card front. 11. Add the big silver star from Pretty Pink Posh on top of the Christmas tree and add the rhinestone to its centre. Card is finished. Now change the pattern paper on the back of the shaker box and on the card front to make three more shaker cards. It is that simple. By using the pattern papers from the same collection or paper pad, it is easier to coordinate papers and thereby the sequins as well. Here are rest of the three shaker cards. 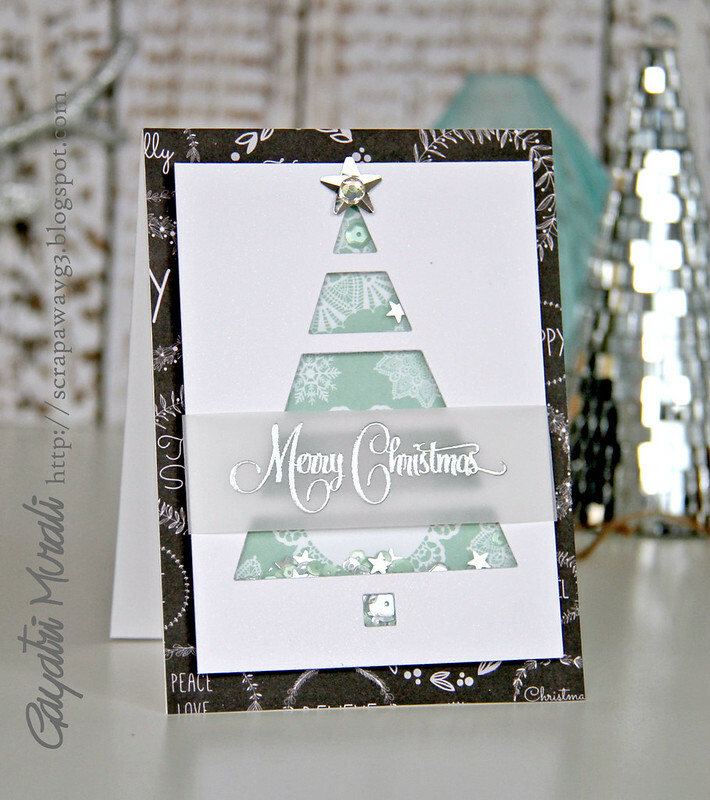 This set is very easy to make as the only stamping that is done is the sentiment. Again, prepare by trimming, diecutting, spraying and embossing the sentiment. Then it is easy to assemble sitting in front of the television. 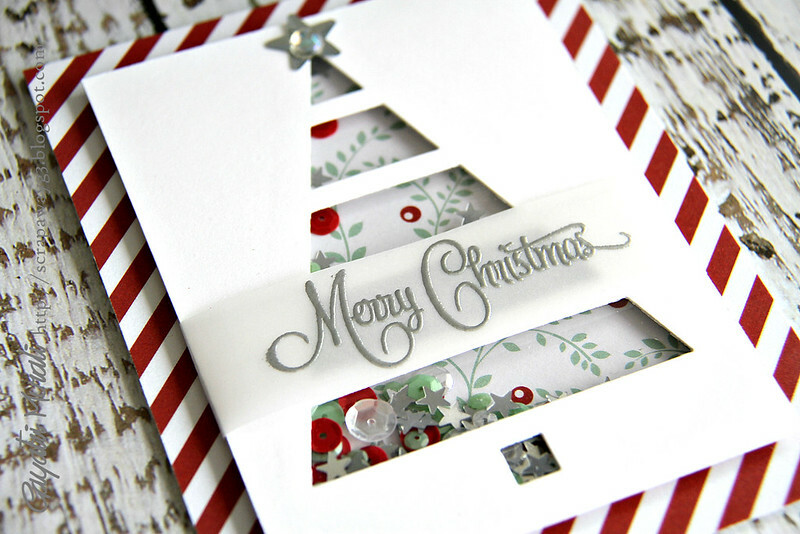 Don’t forget to follow my Christmas card Pinterest Board. LOVE this set, Gayatri! Very fun shaker cards. Your Christmas card sets are over-the-top exceptional. I LOVE each and every set! You've done it again…really lovely cards. Lucky recipients. Fabulous set, Gayatri – although, I would not be able to multi task like that, let alone proceed such lovely work! Fabulous set! I love everything about them and am especially taken with the tiny prints in the background of the shaker. Wonderful shaker cards Gayatri. You've been so busy!